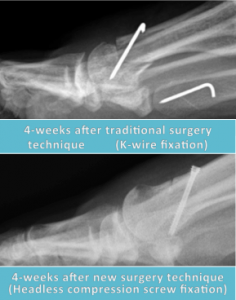 Our podiatric surgeon Dr Andrew Knox performs an advanced surgical technique for bunion correction in Perth which significantly reduces the downtime after surgery in comparison with the traditional surgery technique still employed by most foot surgeons in Australia. The surgery involves the use of a headless compression screw which is placed through the bone being realigned which allows for primary bone healing to occur at the site where the bunion has been corrected. This significantly reduces the time taken for the bone to heal overall. Patients are permitted to weightbear immediately post-surgery and generally return to activities 50% faster than in more traditional approaches of bunion correction. he surgery is usually performed as a day surgery procedure under general anaesthesia and generally takes around 45 minutes. Click here to read our recent blog on What To Expect After Bunion Surgery. This website is intended for general information purposes only. Any surgical or invasive procedure carries risks. Before proceeding, you should seek a second opinion from an appropriately qualified health practitioner. For more information on bunion surgery in Perth, we recommend making an appointment to see our specialist podiatric surgeon Dr. Andrew Knox.